An independent, self-drive Argentina motorhome rental holiday really is the only way to explore a country as large as Argentina while keeping costs affordable. We have depots in Buenos Aires, Mendoza, and Ushuaia in the south for your convenience. From there a variety of experiences await you. Let one of our luxury Argentina motorhome rental vehicles become your home from home in Argentina. A superb series of modern roads and express highways interconnect all major cities in Argentina. A highly literate population makes English almost the national language. This helps ensure a hassle-free holiday in the eight-largest country by global standards. The climate varies from tropical in the north to polar in the far south. The geography of Argentina is equally varied. The northwest region features rugged mountains separated by narrow valleys, while Grand Chaco offers a subtropical, low-lying plain. To the south, the Sierra Pampeanas guard the entrance to the central Cuyo Basin and the Pampas plains beyond. Finally, you come upon the chilly Patagonia plateau, as far south as you can go. There is almost no end to the tourist attractions in this modern, prosperous country. 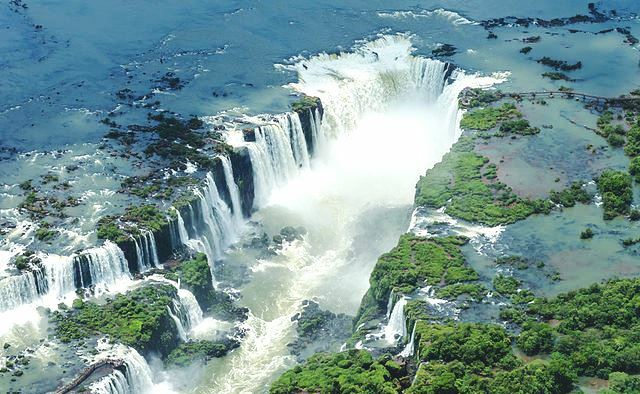 Try to include a stopover at the Iguazu Falls considered one of the seven wonders of nature. It has 272 drops across a width of 2.7 kilometres / 1.7 miles. Arrange a stopover within sight and sound of this marvel of nature, while the comfortable beds in your rental motorhome invite you to a peaceful night’s sleep. As you travel, you discover Argentina is a global village with a unique blend of cultures you may discover nowhere else. Italian, Spanish, French, United Kingdom, and German influences blend with indigenous people to create a rare mix. The rhythm of the music is special, while the texture and taste of the beefsteaks on a wood barbecue is legendary. Argentina is also a mega-diverse country, with 15 continental zones, 3 oceanic zones, and the Antarctic region all in one subcontinent. Come to Argentina. Discover a modern, prosperous society with a climate and open spaces Europe longs for.